Our practice is focused on making your dental experience as comfortable as possible. 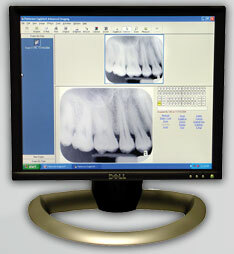 At your next appointment, we’ll be happy to answer any questions you may have about our digital X-ray technology. Dentistry by Design is equipped with Sterisil Straw V2, a device that works 365 days per year to maintain sterile unit water lines on a continuous basis. At Dentistry by Design, we believe the quality of the water used is of the utmost importance. Scientific evidence shows that water used routinely in dental offices may be heavily contaminated with microorganisms that live and multiply in the water lines and tubing. Microbial contamination might occur in dental offices as well, if strict safety measures are not taken. To ensure the effectiveness of the dental unit waterline-sterilizing regimen, our office undergoes monthly testing by medical labs. Our water system is equipped with the Sterisil V2. This is a non-toxic, non-corrosive device placed in our water which has a built-in shock treatment that releases automatically to kill pre-existing bacteria. The Sterisil V2 meets BMP compliance and does not contain oxidizers such as iodine and chlorine, which have been shown to release mercury into dental waste water. The health and safety of our patients is our top priority. You know the importance of prevention when it comes to your dental health, and we’re always looking for new, improved ways to help you achieve a healthy smile for life. While X-rays provide valuable information, they don’t give a complete view of everything going on inside your mouth. With an intraoral camera, we can see every aspect of your teeth and mouth with incredible detail, uncovering cracked teeth, plaque deposits, cavities next to fillings, and excessive wear. When we can discover oral problems early on, your treatment is much less invasive and much more cost-effective. 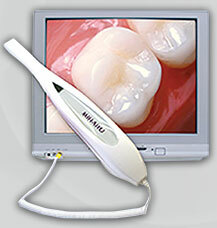 Our intraoral camera is small: about the size of the mirror we use during your regular hygiene appointments. You probably wouldn’t even notice we’re using it, except that with the intraoral camera, you have the opportunity to see everything we see on a monitor. This is a great tool to help you become more informed about your dental health, because it gives you a clear understanding of your teeth’s condition, and allows you to make more informed decisions regarding your treatment options. Laser technology is a safe and effective approach for many dental treatments. 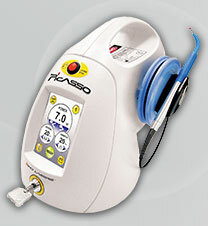 We feature the Picasso laser, which is virtually painless and produces results that are nearly miraculous. Most treatments that used to require scalpels and incisions are now performed with the laser, and virtually no discomfort during or after the procedure. With this FDA-approved Picasso laser, we can instantly re-contour inflamed tissue areas and treat uneven gum lines, and even provide relief from painful canker sores and mouth ulcers. When it comes to going to the dentist, we understand you may feel some anxiety and have tailored our practice to meet your needs. 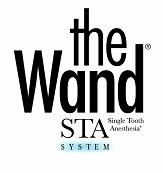 Our office is proud to offer the Wand STA Single Tooth Anesthesia System, which will make your dental experience as comfortable and stress-free as possible. Many types of dental treatments rely on anesthetic injections, but if you’re not comfortable receiving them, this may mean your treatment cannot be completed. STA Single Tooth Anesthetic System using the Wand hand-piece is a computer-controlled dental injection system and one of the most efficient ways to numb an area because of its slow, steady delivery of anesthetic. This also means less discomfort for you, since most of the sting from an injection comes from the solution being delivered too quickly. You can be assured that at our office, your comfort is our top priority.